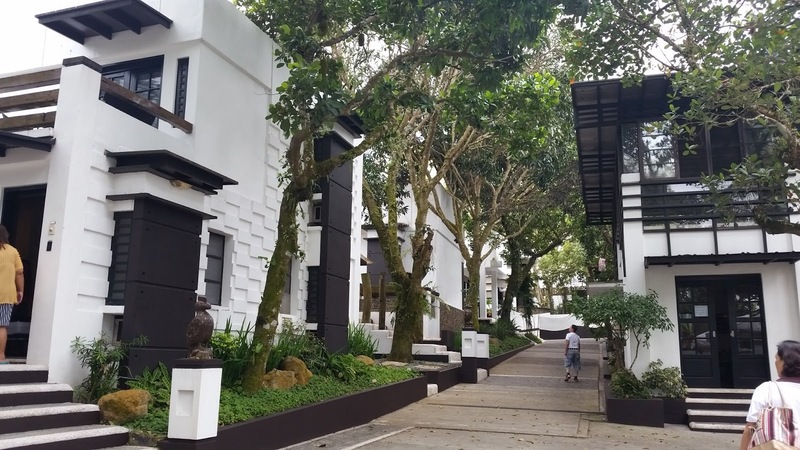 Last March, my family and I went to T-House in Tagaytay for an overnight R&R. It was our birthday treat to papa and ate Mariko. It was a beautiful place, without a doubt, but we had mixed feelings throughout the trip. One of our favorite part about T-House is that it’s right beside our favorite coffee shop in Tagaytay, Java Jazz. But coming from the road, the driveway was so steep, it was slightly heartpounding. And the guard stopped us right at the point where we were inclined by 45 degrees. My father was pissed because it felt so dangerous for him. But he calmed down once we were inside because it really was soothing inside. 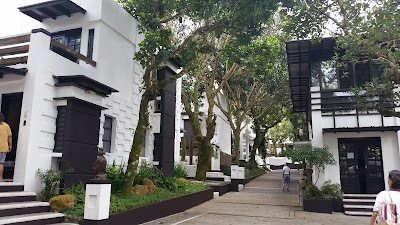 In fact, he was really impressed by how T-House Tagaytay grew to his relaxing room cluster. 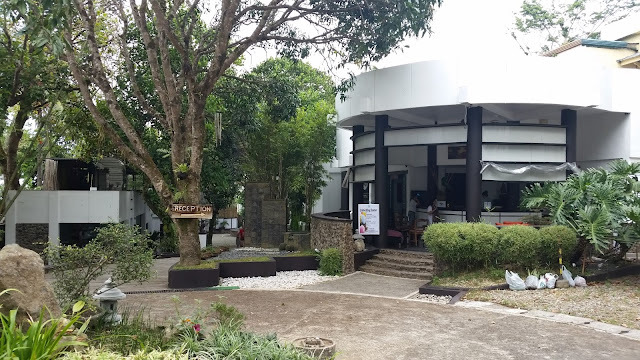 T-House Tagaytay is divided into three clusters. The voucher and room was only for four people, but I called ahead of time and paid extra to include ate Apple for an extra bed and the set breakfast. They presented two rooms for us. I liked the first room because it had a bath tub, and I love bath tubs because we don’t have one at home, and it always signifies relaxation for me. I spend at least forty minutes to an hour in bath tubs when my hotel room has one. 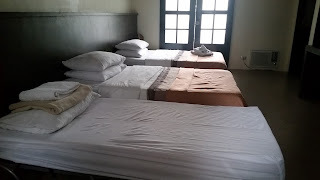 However, we had to choose the bigger room, the Serenity room, with only a shower so we can fit five adults and one adult. 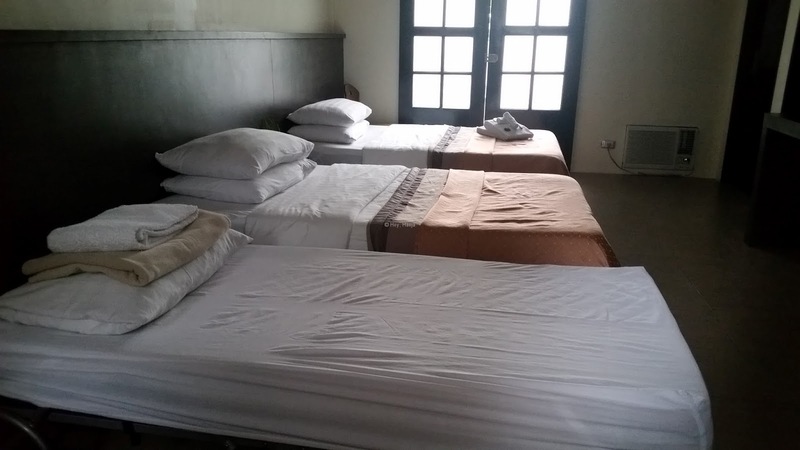 Our room had three single beds plus one queen mattress on the floor. The beds were okay. The room was clean, and the pillows were soft enough. If you’re looking to relax, this was definitely the place. Our room also had easy access to the garden/patio outside. We were a little nervous that our room had two doors (see that door in the photo), but the room locked just fine, and we had a good night’s sleep. The room also has a TV and a small living area, plus a huge wall and dresser with a water heater. If you’re travelling with kids, they will let you refrigerate your children’s milk in their kitchen — just label it properly and ask the front desk. We were pretty relaxed until my father used the toilet and it clogged. We had to call for a plumber (well, the hotel’s in-house plumber), but it was a bit of a hassle and discomfort for us. 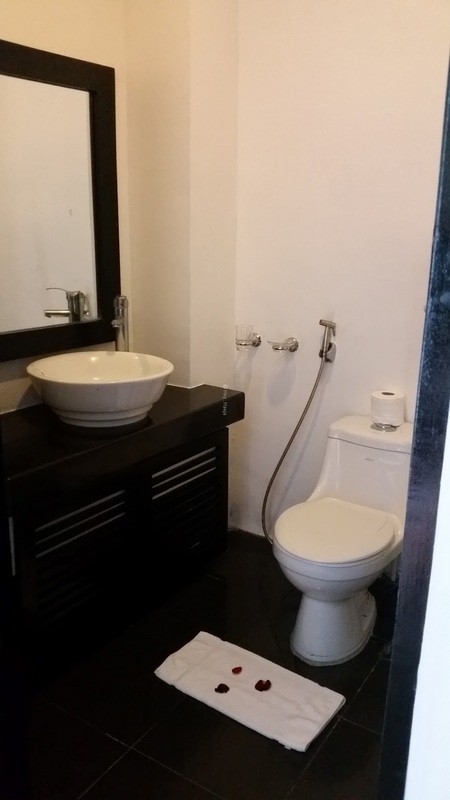 However, after fixing the toilet, we didn’t have any more problems throughout our stay. Also note that they don’t provide slippers and toothpaste, so you have to bring your own. 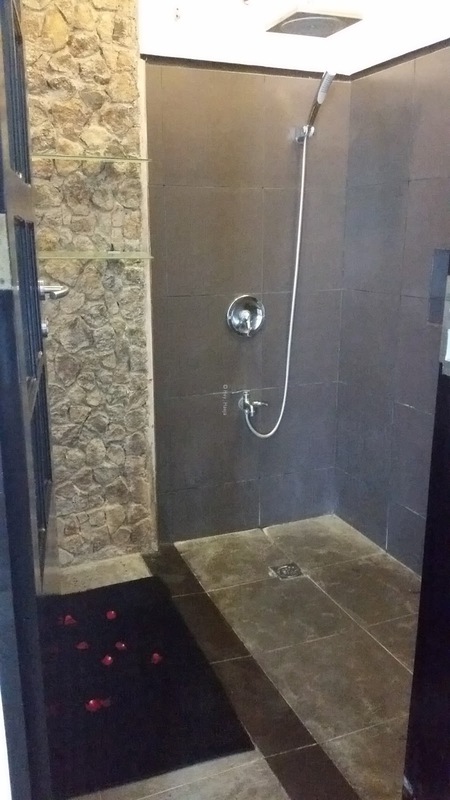 But one feature of the shower that made my sister and I laugh uncontrollably was when I was taking a bath, and she was using the toilet, and we realized the only partition separating the toilet and shower was a glazed glass wall. I think it took me ten minutes to finish showering because I just kept making funny faces through the glass. We also had fun imagining scenarios where friends would book this room and one uses the toilet while someone is taking a shower. I can just imagine the surprise, especially if they’re two straight guys! One detail that surprised us when we entered were the rose petals on the toilet and shower areas. It was a nice little touch, though. Since guests at the T-House had a discount for their spa services, we were all quite excited to try out their massage. Ate Mariko was especially excited because she was looking for a massage as good as the one we had at Injap Tower Hotel in Iloilo. 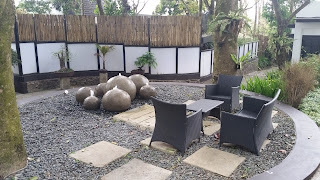 However, their massage roster was full for the day until Sunday afternoon, at the time we were leaving Tagaytay. Apparently, they also accept clients who are not checked-in at T-House. So if you’re planning to stay at T-House and want to book a massage, calling ahead is definitely a must. That was such a buzzkill. My niece Aj had a lot of fun with all the space, though. We kept taking turns throwing around a soft ball. 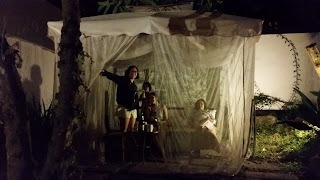 Afterwards, my sisters and I relaxed in the huge sofa with netting and watched a movie and read books. With all the trees and plants around us, it didn’t feel so hot and while we stayed there. Cool and breezy but had a lot of mosquitos! Also, we were so excited to enjoy their infinity pool, but they had a party being held in their pool area, and hotel guests were not allowed to swim. We felt so bad, so we just went to Starbucks at Robinsons. But for dinner, we went to Java Jazz because it was a rainy and cold night, and we knew their tsokolate-eh was just the thing. When we got back to T-House, it was already dark out. I played a quick game of sungka with ate Apple (they have two at the reception as well as some books guests can borrow for the duration of their stay). Afterwards, I ordered a cocktail for me as my parents brought out the wine they brought. T-House also gave us free tasty chocolate brownies. Relaxation was definitely the agenda of the day. It was such a relief to have that netting. We were safe from the mosquitos. The bedding just felt a little damp, but that must be because of the slight drizzle. I ordered a cocktail from T-House’s restaurant, but the bartender delivered it straight to where I was (I told him where I’ll be, of course). The cocktail tasted weak, though, and not as delicious as others I’ve drank. But the food of the other diners looked and smelled good when I passed by. Our set breakfast the next day was okay; nothing to write home about but nothing to sniff at either. The next day, my parents went to Sunday mass at 8am. We were right beside a Catholic church, so T-House’s location was definitely convenient. My sisters and I went swimming instead, since we were going to mass when we went home to Manila. When we got there, there was only a couple of guests enjoying the place. The pool is pretty small, and if you like to take laps, make sure you’ll be alone in the pool. The other half of the pool is dedicated to a jacuzzi that was also small enough for kids. 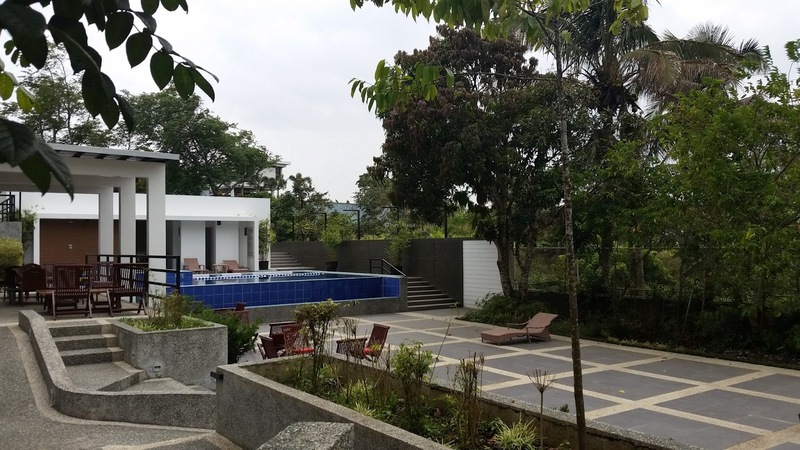 The other 1/4 was dedicated to three tiled beds where you can sunbathe, literally, because your back will be slightly soaked in the pool water as you take in the sun. If you’re using eyeglasses while swimming, make sure they won’t fall out of your head! My sister’s eyeglasses fell off while we were leaning over the edge, and it fell down on to the slightly dirty run off from the pool. Even though there’s a patio and small kitchen in the pool area, there was no server. The bathroom was on the path towards the pool, but they were locked when we were there so we had to run to our bedroom. We didn’t use the changing area in the pool room, though, because it was a little dusty and we were the only ones there. Our stay in T-House Tagaytay was a mixture of relaxation and slight exasperation, but we definitely enjoyed the vibe of the place. The rooms are a little pricey, but we were able to get a huge discount because of a Dealgrocer voucher.